This is my final post for my Women’s and Gender Studies project. To help me visualize my learning I created a word cloud of my most common words and the focus of my posts. First of all, I want to try to make sense of my project. As an aspiring teacher, I feel the need to address the problems that hypersexualization cause, as well as the systemic oppression of females. I wanted to extend my learning about issues regarding sexuality, gender differences/gender equality, etc.. I also want to be able to teach tolerance, teach inclusively, and teach about diversity. Because of this, I tried to focus on issues that impact females more than males. I also spent some time providing information about MMIW for ELA 20 and A30. I decided to do a culminating activity to help gather my thoughts and this video below is the result. I used the sheets of paper in “Amanda Todd” fashion, not only because she was part of my project, but also because I wanted my words to “speak louder” than my appearance. 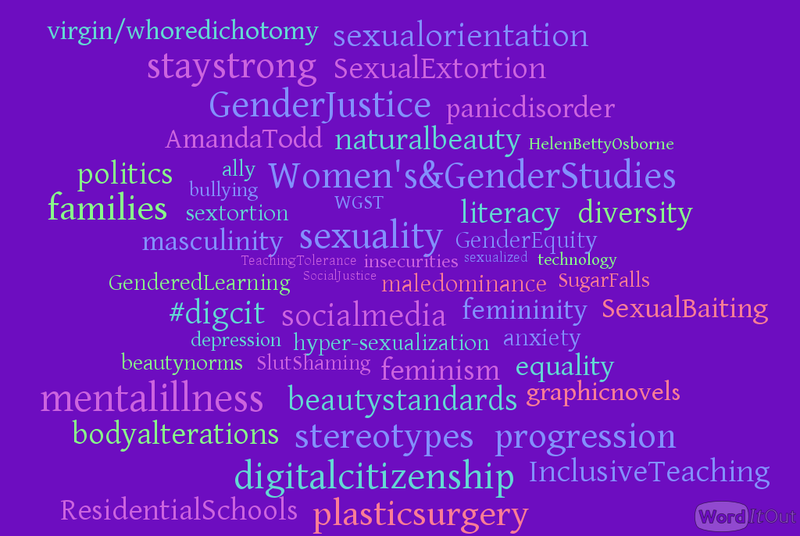 This entry was posted in Social Justice, Uncategorized, WGST 100: Introduction to Women's and Genders Studies and tagged Ally, Diversity, Equality, Inclusive Teaching, Philosophy of Education, Resources, Sexual Orientation, Sexuality, Social Media, Stay Strong, Summary of Learning, Teaching Tolerance, WGST100, Women's and Gender Studies. Bookmark the permalink.